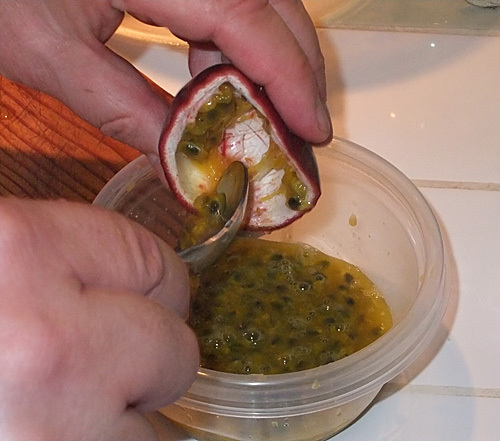 It seems like I'm finally going to be pushed into making jam -- something I've wanted to do for a while but have put off -- because our passionfruit vine is overflowing with lots of fruit. 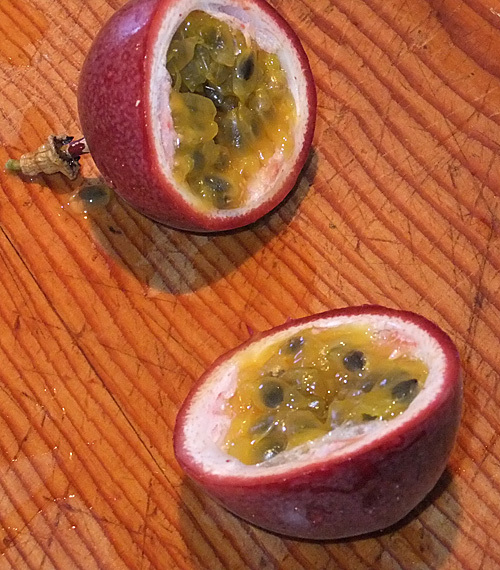 We decided to grow this because my husband and I both love passionfruit. For me, it's a reminder of home: of passionfruit folded into whipped cream which ended up on the top of pavlova. Yum. 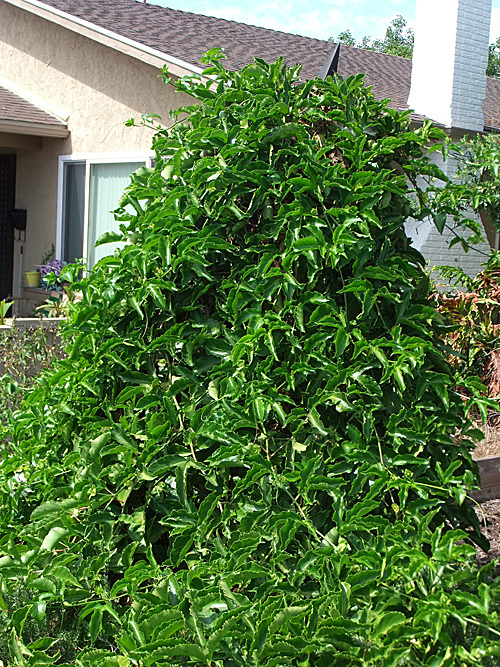 The vine is in danger of taking over the front yard (and shades our vege garden more than I would like). The flowers are pretty, but small. 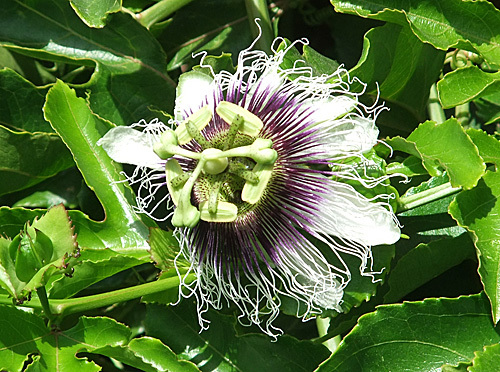 The name passionfruit comes from the stamen of these flowers that look like Jesus' Cross, aka the Passion. We've harvested two large containers of these. So far. We froze some of the fruit, which is basically slicing them in two and scooping out the seeds and flesh with a teaspoon. The fruit are at their peak when their purple skin dimples, but so long as the skin is that lovely dark purple they are good to eat. while I document with my camera for this blog! I made passionfruit cookies. 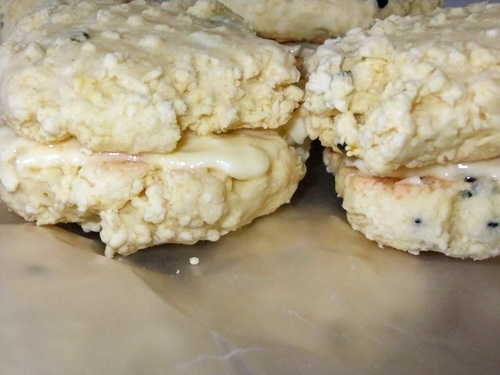 It was from an Australian recipe (so really they are biscuits, just not remotely like American biscuits), so I think I still need to tweak it a little because it was too dry to form a dough and I had to add additional passionfruit and water and I think the latter added to a reduced melt-in-the-mouthness that I was expecting. 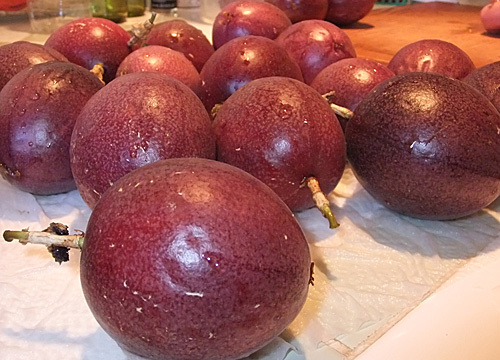 By the end of this week, I'm planning to make passionfruit jam. There are two kinds apparently: one using just the skins (!) and another using mostly the seeds and flesh with some of inside of the skins because they are so loaded with pectin which is what makes jam not be sauce. This'll be my first jam making exercise so I'm a bit nervous about it, but it'll either work or it won't. And I'd make passionfruit vanilla slice, but that only takes one passionfruit and I have a stack.